Welcome to another installment of RETRO REVIEW, where we take a trip back in time and look at films made before the year 2000. 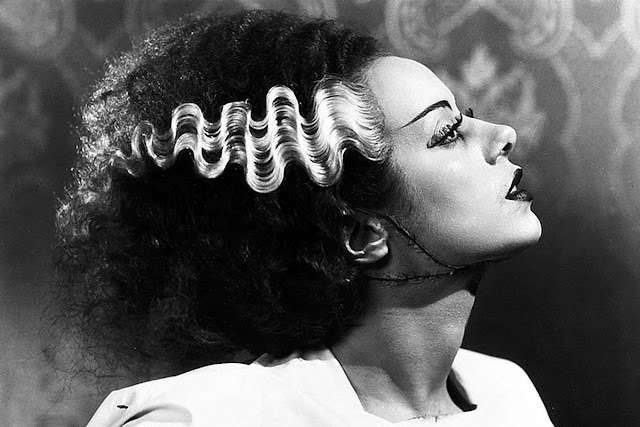 Today we review the 1935 monster classic THE BRIDE OF FRANKENSTEIN. Enjoy! The Bride of Frankenstein is a story that continues the mythos of Frankenstein into new and inventive territories. The story is about Frankenstein’s monster and how he survived through the events of the last film, but more so it’s about the scientist’s quest to make the monster a mate. This film is probably one of the best films I’ve seen from the 1930’s. It has its own problems but when comparing it to some of the other films from the 30’s, this film stands out. It starts off and as an audience member I knew I was watching something special. The lighting on the castle and the production design was so elegant yet it set a tone for what the film is. I didn’t like the opening sequence in terms of story because it threw the pacing off for the film as a whole and lowered the stakes for me as a viewer. However, once the film progresses, it more than makes up for it, due to the stellar performance of the monster played by Boris Karloff. His ability to channel rage then turn it off made you really empathize with the monster as he is incredibly misunderstood. Most of the cast were great in the film, some of the lines were overdramatic but that’s to be expected in a film from the 1930’s. However the only performance I found to be less than stellar was Minnie played by Una O’Connor. Her character as a whole was too over the top for someone like me. She would either yell because she’s terrified or act like she’s in complete control. There were no shades of depth in the character, so whenever she said something I usually found myself annoyed rather than invested. I also felt that the editing of the film was rather jarring at times. The cuts were apparent in the middle of a moment where they shouldn’t be. There were moments where they would be jarring for me as an audience then cut again before I had time to digest the information being given to me. This is a flaw in the film, however it’s also something that has been spoiled for me as an audience member in the early 21st century. Overall, I do find this to be a great film. It has moments that leave you terrified, rooting for the monster, and at other times, truly sad. I do think this was a very well made film and a great starting point into old school cinema, if you are looking for one.